Whether it's dicing an onion or breaking down a chicken, it can all be done with a chef's knife. But there are some jobs that require a smaller, more delicate tool. For mincing smaller alliums like shallots, cutting up small fruits, and trimming vegetables, a paring knife is frequently a better choice. Pretty much any task that would feel overly clumsy with a large chef's knife is well suited to a paring knife. Because paring knives are so small, they also allow for different grips and cutting methods: You can work on a board if you're mincing a shallot, but you can also cut "grandma-style" by holding the knife and food aloft and letting the trimmings or pieces fall into whatever vessel is below them. On top of that, they lend themselves to odd jobs in the kitchen. Not sure if your cake is done in the center and you can't find a cake tester? Need to test the tenderness of a roasted beet? A paring knife works in a pinch in both cases, being small and narrow enough to not leave behind any obvious signs that it's been inserted into the food. Paring knives are also useful for peeling onions and garlic, way better than stubby fingers alone at sliding under the dry skin and prying it free. A paring knife is a small knife with a plain edge blade that is ideal for peeling and other small or intricate work (such as deveining a shrimp, removing the seeds from a jalapeño, 'skinning' or cutting small garnishes). It is designed to be an all-purpose knife, similar to a chef's knife, except smaller. Paring knives are usually between 6 and 10 cm (2½ and 4 inches) long. A versatile paring knife is an essential tool in every kitchen. Like the chef's knife, a paring knife is meant to be used for a wide array of jobs, from slicing and dicing to peeling and garnishing; however, the first and foremost function of a paring knife is detail work and greater control. 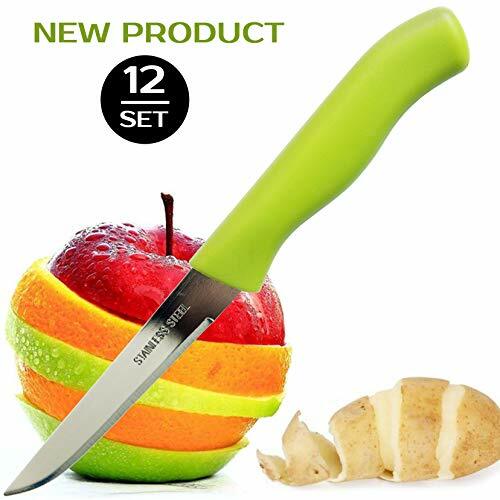 Set includes 12 sharp stainless steel Paring knives, with 3-inch blade and 3.5-inch contoured ergonomic handle with beautiful bright green color. Essential in every kitchen to trim, peel and slice fresh produce. Ideal to use for variety of jobs such as peeling fruits and vegetables or trimming beans, but also versatile enough for bigger jobs. If you have any questions about this product by Brenium, contact us by completing and submitting the form below. If you are looking for a specif part number, please include it with your message.